A girl with dark magic who’s a threat to the kingdom. Three powerful men from the royal court. Why are they prepared to protect this daughter of shadow and take her to the heart of their realm? The dragons are dead, the Ebon queen has destroyed the elven realms, and kingdoms are at war. The queen’s dark magic is growing in strength, and the Silvercrest kingdom is losing the battle against her. Three men are sent from the army’s stronghold to seek others who can aid their cause. Leander, a high-ranking and domineering nobleman. Rohan, a fierce and seductive warrior. Galen, a gentle and passionate elven leader. Their task: recruit the most potent magic users from the shire towns and train them to join the crusade against the Ebon queen. They never expected to find a daughter of shadow. Calla’s time working at the apothecary in her small town is about to end, but not in the way she expected. On the day her magic skills are tested, she is revealed as a shadowmancer, a school of magic banned throughout the kingdom. 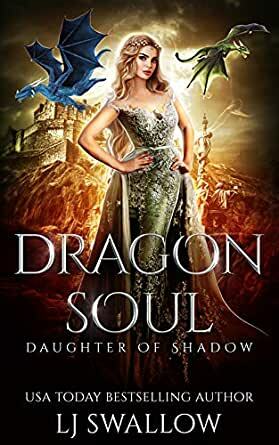 A confused Calla faces a death sentence, but the three men are intrigued by the beautiful girl and her mysterious dragonkin pet and smuggle her from the town. With no other choice, Calla journeys to the stronghold with the three captivating men. As they fight their way through enemy territory, the men discover that Calla’s power is more dangerous than they realised—and so is the bond this creates between them all. Dragon Soul is a slow burn reverse harem fantasy. Action-packed, sword and sorcery book with a strong heroine, a pet dragon, and irresistible guys. Dragon Soul is a Fantasy RH, it could almost be called High Fantasy but falls a bit short of that genre. As I’m a big fantasy fan and a RH fan, I was really looking forward to this book. I know better than to get my hopes up but the blurb sounded promising and the few reviews I read backed it up, however, it only took the first chapter for me to realise it wasn’t going to be what I was expecting; i.e. I was a tad disappointed. I’ve read books by Swallow before and have enjoyed them enough to feel tempted by new books by her, but Dragon Soul felt clunky and was full of info-dumps. I liked the protagonist well enough. Calla (love the name) may be lacking in skill but she’s not really lacking in her conviction to escape the limits of her hometown. Despite this, she talks about her family and her mother fondly enough, and yet when she’s taken from the town not once does she spare a thought for her family and what they must be thinking - I found it all very odd. This is a slow burn RH, with some kissing and petting. There is a slight trigger warning due to one scene and, while there’s no cliffhanger as such, this book is definitely building up to the next one. I found the premise of the plot line interesting and like Swallow’s creativity, however I will probably not continue with the series. I given it 4 star because I felt it's been rushed, not enough character building, I mean compare to the four horsemen this is not even close. I didn't feel any chemistry between Calla and her guys till nearly the end, I would appreciate more character and world building I hope it gets rectify because this series has a huge potential. This story was interesting. The characters were entertaining and slightly complex. The storyline was intriguing. I will have to read the next one to get more answers. WOW - what a great first book to a new series. Loved the characters, storyline and eagerly awaiting book #2. Great story, loveable characters and the plot is thickening into greatness. Bring on book 2! Well done Lisa! Wow!! I enjoyed this book from the first sentence to the last and was so disappointed when it ended. Calla is a young country girl who has magic in her family. Her Dad is a sorcerer and she has some talent. It is her 21st year and her town is due for the annual testing. Calla has a dragon kin called Luin. This is rare but he is her pet and friend. As people start to arrive for the testing, strangers arrive in town. Two humans one called Rohan and he is a lightbringer in the King’s army, Leander a High Lord and an elf named Galen. They are looking for Calla. An unexpected event brings them together. Calla is a shadowmancer. As they travel they become more acquainted and they each try to understand their relationship with each other. Calla has magic that is outlawed and she should be killed but the men all want to protect her. I read this book in one sitting and LJ Swallow has written another wonderful, rich and fast paced story. I encourage you to pick up this book and begin a great journey with Calla, Rohan, Galen and Leander. LJ Swallow won’t disappoint you. 4.0 out of 5 starsAn exciting adventure!! Like all of LJ Swallow’s books this one kept my attention captivated from page one until the very end! This is a new world and it takes a bit to learn it all but it is a really different story and I am intrigued to see where it will go next. All the MCs are very fascinating and I am already fully invested in what happens to them. This book is highly recommended especially to all the fantasy RH book lovers! A book that is full of Fae, magic, smouldering moments and action...I am excited to read book 2!! Can’t wait for second book to come, great characters and plot, it’s going to be a great journey of adventure with some humor and romantic tension.